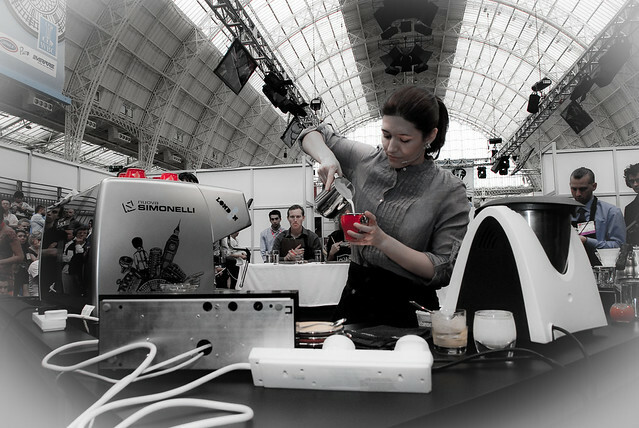 Last week London was abuzz with activity surrounding the World Barista Championships. The national champions of 54 countries came to London to compete for the title of World Barista Champion. Each competitor had 15 minutes to prepare four espressos, four cappucinos, and four espresso-based signature drinks of their own design. And they must do this all whilst talking passionately about the coffee they’re using. This year’s World Champion is Mike Phillips from the USA. Mike works for Intelligentsia Coffee in Chicago and he is the first World Champion to come from the United States. For all my WBC photographs click through here. This year I volunteered to be a ‘barista buddy’. My role was to help a competitor find equipment, ingredients and to provide local knowledge. I was the buddy to Honduran Champion Anna Lucia Hawitt and Argentina’s Gustavo Castro. Ana Lucia, in the big image above, placed in the top 12 during the preliminary rounds and made it through to the semi-finals. You can watch her semi-final presentation here.